One night in 1986, a baile funk club called Quarentão located in Ceilândia, a poorer district adjacent to Brazil’s capital city, was raided by police and forcibly shut down. Before the violence began, the police allowed the white patrons of the predominantly black club to exit and then assaulted those who remained. Nearly 30 years later, Brazilian filmmaker Adirley Queirós decided to make a film about this event, White Out, Black In, which focuses on two men who were left crippled by the attack: Marquim do Tropa and Claudio “Shokito” Irinaeus. The film captures them in their present-day lives and uses their individual traumas to unpack the larger significance of that long ago night in the context of highly racially stratified Brazilian society. There are many films that could have been constructed from this material—perhaps a straightforwardly effective piece of nonfiction with some vérité footage of the injured men navigating through space (Marquim is wheelchair-bound, Shokito uses prosthetic and crutches), some interviews, a dash of carefully sourced archival. Perhaps a narrative with actors and an expensive, handsomely mounted recreation of the police raid. Or there is the route taken by Queirós who introduces an element of speculative fiction by tossing a third character into the mix, one Dimas (played by Dilmar Duraes), who is an investigator sent from near future 2075 to glean the facts about the Quarentão event from Marquis and Shokito, and potentially use what he learns to change the future of Brazil. Other sci-fi elements are laced throughout White Out, Black In: Marquim, illuminated by the glow of technology, broadcasting pirate radio at night in his retrofitted, handicapped-equipped home; Shokito working his way through piles of plastic limbs in junkyards; or the way Ceilândia, an impoverished city created from scratch by the Brazilian government in the 1970s to keep undesirables from erecting shantytowns in the capital, is filmed as a fluorescent nightmare-scape. Yet there are also painfully direct interviews with both subjects, footage of them moving laboriously through their environments. What is White Out, Black In exactly? At this stage in the evolution of cinema, it’s exciting to run across an object that’s not easily classified as one thing or another, which seems able to be many things all at once. Queirós’s follow-up, Once There Was Brasilia, keeps a foot in nonfiction, but in most other respects rockets off to a different cinematic galaxy entirely. Where White Out, Black In might be broadly categorized as a docufiction (albeit of a mutated strand), Once There Was Brasilia is a sci-fi epic about assassins from space and the impeachment of Brazilian President Dilma Rousseff, achieved on a shoestring budget. It finds antecedents in movies like Alphaville, Mad Max, La Jetée, and Robert Kramer’s Ice, but Queirós’s innovation remains the insertion of bits and pieces of his characters’ lives into his science fiction fantasia. Brasilia begins on a note of unease. Curly-haired Andreia (Andreia Vieira) waits, lit by streetlamp on a pedestrian overpass, while horrible screeching sounds echo around her in the night. Wheelchair-bound Marquim (White Out, Black In’s Tropa) maneuvers toward her, wearing makeshift armor fashioned from the remnants of what might once have been welding gear. They exchange some pleasantries and smoke some cigarettes before their conversation takes a turn. Andreia, it seems, chooses this spot to hide from “the radar.” Marquim soberly notes that he was once shot with a .22 (a reminder of the raid examined in White Out, Black In that left him paralyzed) and that lately he’s had some strange visions. Andreia’s apparently been seeing them too. Her own tale is similarly woeful to Marquim’s: she accidentally killed a man who groped her in a bar, and was imprisoned as a result. The two are waiting for something or someone from outer space with the promise that this arrival could help save their homeland, though at this point in the film we can only intuit the dangers Brazil faces. Throughout the film, conversations between characters lurch from the quotidian to the unreal and back with mentions of court appearances and unjust sentencing interspersed with talk of assassinations and plots. Such personal “documentary” bits help ground the film’s potentially unmoored dystopia. (Queirós also includes a scene of Marquim in a hip-hop performance and Andreia stopping home to spend some time with her children.) After the lengthy destabilizing opening dialogue between Marquis and Andreia, the film makes its boldest shift, literally to the stars, where we meet WA4 (Wellington Abreu), an intergalactic mercenary sent from his home planet to assassinate Juscelino Kubitschek, the founder of modern Brazil. His spaceship, seemingly a common delivery van gutted and retrofitted with the best in low-budget production design, goes astray and he winds up instead in present-day Brazil on the eve of the coup-like impeachment effort mounted against President Rousseff. After his crash landing, WA4 connects with the ragtag group of rebels. He also has stories to share: of being locked up, branded as crazy and tormented by police on his home planet. These shards of story seem likely to have been culled from his life off-screen, but Queirós builds them into his narrative as preconditions that led WA4 to accept his dangerous Earth mission. If he succeeds, back on his home planet, his family will be provided good, free housing by the corrupt government. Filmmakers encouraging non-actors to incorporate bits of their lives and personalities into their performed roles is nothing new, but this approach has generally been enacted in order to bestow on films a sense of authenticity. I’m not sure that I’ve run across many other works like this, in which the material of real existence is so thoroughly collided and confused with a genre that would normally be posited as its direct opposite. Throughout Brasilia, viewers are kept attuned to the drama’s political context via intrusions of audio recordings from the momentous events around the impeachment. Though Rousseff was impeached via a constitutional process, even from my uneducated vantage point the events comes with is a whiff of something rotten around it. (With Brazil having just elected their own right-wing populist Trump, it seems whatever strategy was at work in the actions taken by Vice-President Michael Temer’s Brazilian Democratic Movement Party backfired mightily.) Queirós doesn’t answer these questions: it is clear from the film that whatever the reasons for this political act, such a corrupt political system promises to plunge emergent Brazil into a perpetual blackness, and perhaps even erase it entirely. Given that WA4’s initial target was Kubitschek, perhaps Queirós is also suggesting the Brazilian enterprise as one corroded from its outset. The sun might as well never have existed in the entirely nighttime world of Once There Was Brasilia. The film’s disorienting, suffocating darkness and flickering fires give the impression that everything we’re witnessing could have all happened in one evening. (Or is it to suggest the country’s encroaching ruination?) The film’s images are marked by smeary neon blues, yellows, and oranges. Where the light doesn’t touch, the film drops off into inky black. Much of Brasilia takes place in tightly enclosed spaces: first WA4’s single-seater spacecraft and later the four-door patrol car in which the rebels prowl the empty streets of Ceilândia. Queirós and cinematographer Joana Pimente make the most of their limitations, miraculously dodging visual staleness. Long sections of the film are devoted to watching WA4 in his tiny craft, smoking, sleeping, grilling some chicken, and just waiting for his landing. There’s a bagginess to the two Queirós films that I’ve seen (he also made a previous hybrid work called A Cidade é Uma Só? in 2011), especially Brasilia, which might scan as indulgent, but it’s worth luxuriating in the details of his frames, even when nothing much seems to be happening in them. The film’s phantasmagoric yet lackadaisical quality put me in the mind of Samuel Delaney’s landmark sci-fi epic novel Dhalgren, in which the fictional midwestern city of Bellona, cut-off from the rest of America by an unspecified accident, becomes a playground in which people enact rituals around crime, sexuality, and gender. Like the characters in Brasilia, Delaney’s grifters ping off of the real-world events that surrounded their creation. 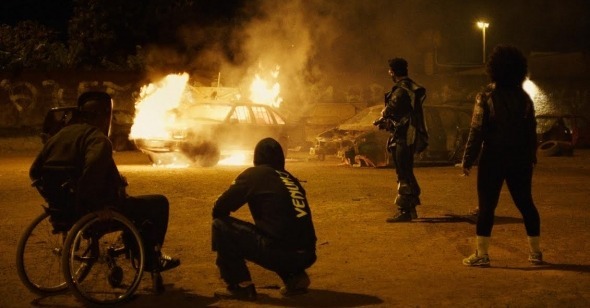 Late in the film, the Marquim, Andreia, and WA4 gather with a handful of other warriors to duel it out in the so-called 27th Intergalactic Championship of Ceilândia, set in a low-rent parking lot Thunderdome. The fight begins, but is interrupted my Marquim’s call to arms: “The enemy is on the streets. The monsters are everywhere. In the Congress, in the Ministries, in the Palace.” It’s a rallying cry to bring the group together to fight the true enemy—Brazil’s political system. On the night raid that follows, which plays like a dystopic Keystone Kops episode, it seems like they might take out the president, but his car gets away. Dejected, they listen to the radio as Michael Temer assumes the presidency following an “open and democratic process”. Afterwards, the group blows up their car and Queirós lingers as they watch it burn. In the film’s final shot, WA4, Marqium, and Andreia end up on the pedestrian bridge from the opening arrayed in an aggressive tableau—watching, waiting, defeated, but still resolved, something like Brazil’s own Avengers. They turn to the camera, almost as if asking their audience: will you join? Both of Queirós’s recent features turn to science fiction to more thoroughly investigate Brazil’s complicated, layered histories of racism, classism, and political corruption, suggesting grim potential futures for one of the world’s most populous countries. It’s odd to call a film as consumed by darkness and paranoia as Once There Was Brasilia playful, but Queirós’s approach is sui generis and often thrilling. Like some of the most exciting cinema these days (i.e., By the Time It Gets Dark and The Human Surge, to name two that landed on Reverse Shot’s 2017 year-end list, and helped inspire this symposium), Queirós’s film has few allegiances to traditional models, and seems uninterested in employing formal strategies to make a critique of film form per se. Instead, it’s all-hands-on-deck, everything-and-the-kitchen-sink filmmaking that’s daringly political and unconcerned with how we might eventually, foolishly, try to pin a label on it.